Since 2006, Apollo Lasers has been delivering some of the world's best and most powerful lasers. Their family of FDA cleared lasers offers exceptional value in the class 4 group of lasers. With a balance of power and safety, Apollo lasers are widely accepted as one of the standards for professional use. All Apollo lasers are built of heavy-duty aerospace quality aluminum construction for maximum durability in both office and clinical environments. With up to 5 watts (5,000 mW) of continuous power at 810nm, these lasers were created to achieve optimum energy density in a very short period. Their 500mW trigger point probe / emitter can deliver densities up to 167.4 J/cm2 per minute so it is perfect for acupuncturist and practitioners working with trigger point therapy or treating small areas of the face and hands. The larger Apollo probes can deliver up to 72 J/cm2 per minute in a treatment area of over 1 square inch. Every system comes with a training DVD and protocol manual. After a quick review of the training literature, most users are experts in just a few therapy sessions. 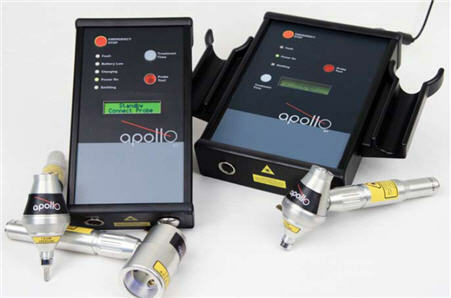 Apollo lasers come in 3 different styles. The desktop and Portable are both FDA cleared and Health Canada certified products. The handheld does not have Health Canada certification. 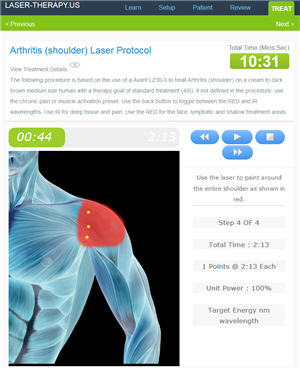 "Higher doses are more analgesic, lower doses more healing"
When you buy an Apollo cold laser, you can control the energy density buy using different probes and treatment times to achieve your desired results. At ColdLasers.Org, we focus 100% on cold lasers. We don't sell other therapeutic devices that would distract up from being the best source for cold lasers. If you need help choosing the best low level laser, call us at 1-800-388-0850. Notice: The LZR 7 Class IV Laser a re-branded version of Apollo desktop unit. According to the manufacturer, the LRZ7 is being replaced with a new system. This system uses the same design and emitters as the Apollo but they spec them slightly higher. The LZR7 5 watt emitter is rated at 5.1 watts. Any Apollo system can be purchases with dual emitter to get the exact same system and Apollo system are always cheaper.